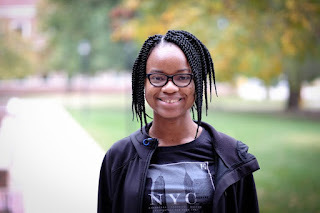 WICHITA, KANSAS (THE SUNFLOWER) --Sophomore Ijeoma Obi moved from her homeland of Nigeria to the United States at the age of 17 to pursue a degree in biomedical engineering. Obi said she was motivated by a desire for a better education. Wichita State has also provided Obi with the opportunity to participate in student groups such as the National Society of Black Engineers. Obi, one of seven children in her family, is the youngest of three to come to the United States pursuing an education. Two of her older sisters also attend Wichita State, so she isn’t entirely alone. Obi said she had a smooth transition from Nigeria to the U.S.
Obi said she keeps in touch with her family in Nigeria, talking on the phone and traveling home for holidays every year. American and Nigerian cultures have a multitude of differences, but Obi said the way people greet each other stands out as the most strikingly different. Looking to the future, Obi said she isn’t sure where she’ll end up or what she’ll be doing. Through the ups and downs of her experience, Obi said she has gained knowledge she wishes to share with others who might consider coming to America for school.